This will do the job. Very dark color-as I wanted. Relax and embrace marvelous comfort with these solid Duvet Covet Sets by Superior®! 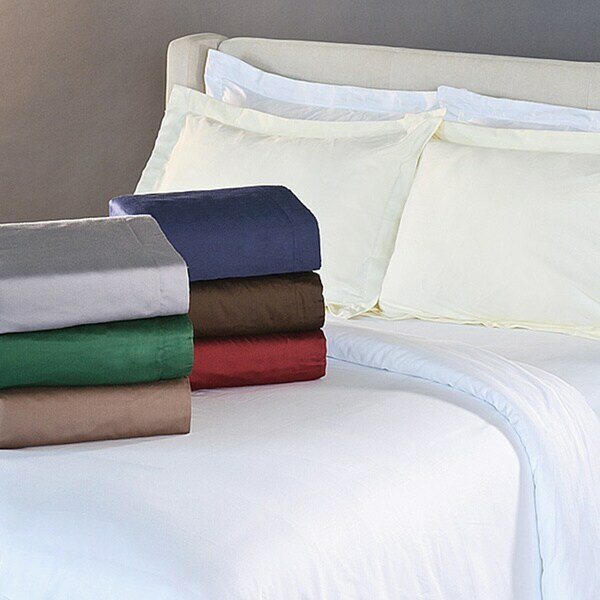 Made from the finest 100-percent Egyptian Cotton with a 400 thread count construction featuring a Sateen weave, this set provides first-class softness and long-lasting durability. Each duvet features a three-button closure for easy placement and quick removal. With their topnotch silky, smooth touch, they're available in eight chic yet modern colors in three different size options perfect for a bedding decor addition of your choice! Care Instruction(s): Machine Washable. Recommended to follow product care label instructions. I am really happy with this purchase! I bought the duvet cover in the Grey color, and it's exactly as pictured. It has a nice subtle sheen. The fabric has a nice weight, but isn't too heavy - just as expected for 400 TC. It was as soft and smooth after washing as when I took it out of the package, and it retained its color without any fading (I followed the washing directions exactly). It's the perfect size for my oversized king down comforter. I love climbing into bed and covering up with this. Wish I could've bought the matching sheets, but unfortunately they don't come in the color I wanted. The only drawback I've found is that I washed it twice to get the smell of the manufacturing chemicals out (in our brand-new HE washer), and I could still smell them. This duvet cover is very soft; I haven't washed it yet, but I'm sure it will only get softer. It feels heavy and luxurious-- totally worth the price. My only complaint is that it isn't true to the size posted in the description. The full/queen is actually 90x92, which isn't a huge deal, but certainly something to be aware of! very nice duvet cover. Good button enclosure at the bottom. i did not notice any shrinkage on this duvet after washing. It is very soft and i like that it comes with the king pillow cases also. The best part is that it is 106 inches wide and fits the down comforter and covers the mattress. I purchased the burgundy in queen size for a puffy oversize down comforter and the fit was great. I received the duvet cover in the middle of a summer heat wave so I waited until the Southern California fog came back before trying it because it seemed so heavy. The Egyptian cotton cover is made in India and this is a plus as I've had good experiences with Indian textiles. The duvet cover has a dense weave, smooth glossy finish, a nice hand feel and it's done a very good job of keeping stray feathers inside. I haven't washed it yet so no news on wrinkling after drying or color fastness. The heavy weight makes it a little awkward to get the comforter inside but stays where you want it. I ordered the duvet in hunter green & it arrived less than 48 hours later. The full/queen size is actually 90X92 (a little bigger than listed.) It was very easy to put over my comforter, even for a first time user (who read Overstock's "how to.") The color is a little darker than pictured, maybe between forest & hunter green. However, it is a very attractive, rich color & looks great after being washed. This is a nice, all cotton product with the smooth look & feel that you would expect. I had searched extensively for a replacement to my existing green comforter, with no luck. This duvet offered an easy solution that let me choose from a wide array of comforters & still match the colors in my bedroom. Color is deep but not overwhelming, & very soft! I got the burgundy/red and I am very happy with it. My walls are "forest gold" (medium yellowish gold), and after I ordered it I worried I would end up with a maroon bed set that contrasted with the walls poorly, but it looks great. I have a plum colored sheet set and two plum pillowcases and the colors all coordinate nicely. Also - If anyone is curious about sizing, I measured my duvet (comforter only/no cover) and, if I remember correctly, it was 86"x86" (if not it's 66"x66", but that seems too small), and I searched for so long on the internet trying to find what size that would translate to. Ultimately, I went with "full/queen", since I have used this duvet on both a full and queen mattress and this cover work perfect! This duvet cover was large enough to cover two extra-long twin beds pushed together. It covers all the way down to the dust ruffle on the sides and the end. The fit is perfect for the California King comforter I ordered to put in it and the shams fit King size pillows perfectly. The cover is very soft and comfortable and wrinkles come out easily. Very pleased with this set. I don't know why others have complained about this duvet. I think it's just great. It's really soft, a lovely color (I got the taupe, which is more of a milk chocolate brown) and you seriously can't beat the price. I searched all over the web and this was the best price I found anywhere. I honestly was expecting something much rougher and lower quality for this price, so I was very pleasantly surprised to find that it was so soft and pretty. It has a very slight sheen to it, nothing too shiny. I would definitely buy this again. I purchased this duvet cover in burgandy - the color is so rich & the material is of good quality. I really do love it. The only thing negative I can say, is that it was made about 5 inches wider than my king sized down comfortor and it hangs over a little. I purchased the navy blue king duvet. It fits perfectly on my oversized king down comforter. The color is a very dark navy. I wasn't sure what to expect from the sateen finish, but once it was washed I couldn't tell it was there. It is not shiny or slippery. The duvet is very good quality. My only complaint is the chemical smell. I washed it twice before using it, and the smell was still strong enough to bother my asthma while I slept. I've had it on my bed for several weeks now, and the odor is still lingering. It is not actually Egyptian Cotton. At least not the soft, silky, Teflon like substance I was used to until recently. It again is more of a brushed cotton which makes everything stick to it. so if you are looking for a duvet that does not collect pet hair, or down feathers, move along. Lovely, even prettier than I thought it would be! I had been looking for a duvet to replace the one we have as it's silk but now our dogs sleep on our bed. Cotton was preferred for ease of washing when needed. I looked for quite a while before I found this one, the price was great and it looked nice online. When I received it I was surprised at the quality, nicer than I thought it would be. I'm thrilled to have a nice duvet again, even better that I can wash it if necessary! Great color grey. This duvet fits well and washes really well. No pilling. Great price. Great set and great feel, have washed dozens of times over and the color is still so rich. The red is fabulous and looks rich and expensive. Love the feel against my skin and love the look on our bed. Very happy with this purchase. This duvet cover washes well. Its soft and cozy and perfect for colder weather nights. I definitely recommend it. I have had nothing but success with the sheets I’ve purchased through Overstock. Great quality and great price. The durability of these sheets washed after washed have been outstanding. Great fabric and durability. The color was true to photo and held up well over washes. The fabric itself also held up well -- no piling like others have done. Love this duvet cover and shams! The price point was perfect for my budget and well worth it! It has held up through many washes and would purchase again! This is a very nice set for the money. The satin feel makes them feel really nice. I would order them again as they are good value for the money. The color has a richness to it. I bought it in the green and I am very happy with my purchase. I find that buying from Overstock is never a risk because of their return policy. I would recommend this Duvet set not only because it is beautiful but because the price was great. "Does anyone know how this duvet is with pet hair? I wanted a sateen fabric to help keep the cat hair from sticking to it, but when it arrived it just seems like regular brushed cotton." The Superior 100-percent Premium Long-staple Combed Cotton 400 Thread Count Solid Sateen Finish 3-piece Duvet Set may pick up pet hair. You may use a standard Twin size comforter with the Superior 100-percent Premium Long-staple Combed Cotton 400 Thread Count Solid Sateen Finish 3-piece Duvet Set - Twin. "ARE THE BUTTONS ON THE END OF THE COVER OR DOWN THE SIDE?" on the end love the duvet. I own like 4 of them because they have a nice sheen and they dryclean nicely and look great. "Can I get a bed skirt to match the burgundy cal-king duvet cover"
Hello camillet1, the only item I found with my search is ITEM# 16144859, I hope this works. Thank you for shopping with us. Hello ditroia, this item features one pillow sham with twin-size set. Thank you for shopping with us. "does the twin set come with one or two pillow covers?"